Three months after the United Nations warned of the imminent risk of famine in Somalia, aid agencies there are battling a humanitarian crisis of epic proportions. Drought has devastated vegetation and water supplies, and hunger is soaring. More than half the country — 6.2 million people — are in need of emergency aid to avoid starvation. And around 1.4 million children will risk acute malnutrition in 2017, according to UNICEF — 50 percent more than what the charity predicted in January. April should have been the height of the rainy season, but most of Somalia saw little to no rain during the month. Estimates for both March and April show that the north of the country received a minuscule amount of rainfall compared to the previous year. 16-year-old Warsama Mahad at the makeshift camp where he lives with his brother and other herders. After three woefully dry rain seasons, the effect on family livelihoods has been catastrophic. 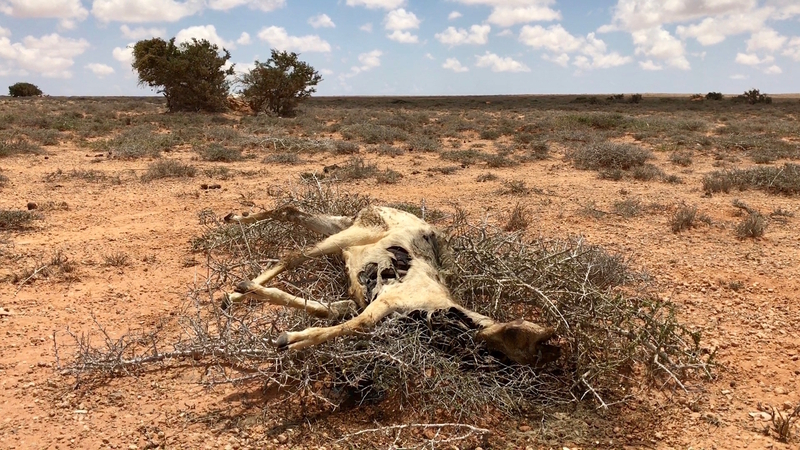 Some 60 percent of Somalis depend on livestock for survival, but as the scorched landscape yields scant vegetation for the animals to eat, 10 million of the 18 million cows, sheep, and goats typically exported have died. A dead goat in Puntland, northeastern Somalia. Livestock is Somalia’s top export, but over half of all animals normally sold have died. “It’s like the last man standing,” Abdul Qadr Hussain, a 42-year-old pastoralist, told VICE News. Hussain has had to move his herd 500 kilometers from his hometown in Mudug, north-central Somalia, in search of grazing pasture. Only 80 of his 600 goats have survived the three consecutive years of drought, and half of the remaining ones are sick. Abdul Qadr Hussain (center) has traveled from his hometown of Mudug, in north-central Somalia, in an attempt to save his herd. Abdul travels with a group of five other male herders, sleeping under sparse thorn bushes and eating rice just once a day. Despite the intense 40-degree (104 Fahrenheit) heat, their only water supply is stored in a few plastic jerry cans. In late March the herders’ animals were being treated with medicine and supplements from the U.N. Food and Agriculture Organization, which has 120 teams of vets helping over 8 million livestock across the country. The goal is to keep the livestock alive and, in turn, the families that rely on them. Vets give live-saving medicine and supplements to some of the country's 8.1 million animals, in a bid to keep herding families from starving. Emergency workers are focusing on safe drinking water, food distribution, cash transfers, and cholera treatment. Somalia is battling its worst cholera epidemic in five years – over 618 people have died of the disease so far in 2017, a figure that the WHO expects to double by the end of June. The hub of the outbreak is centered around south-central Somalia and the capital Mogadishu, where thousands of people are flocking to makeshift camps with unsanitary conditions. Yet aid efforts must also reach rural populations, which make up 90 percent of those in need of urgent food assistance — and are much harder to reach. Muna Hashid Mohammed, 23, and her 1-year-old baby Abdi Khaliq. Unlike for some herders, this is the first time drought has forced her to leave her region – and her two older children, staying behind with their grandparents. Muna Hashid Mohammed lives on the open plains with her herd, her husband, and their 1-year-old baby. 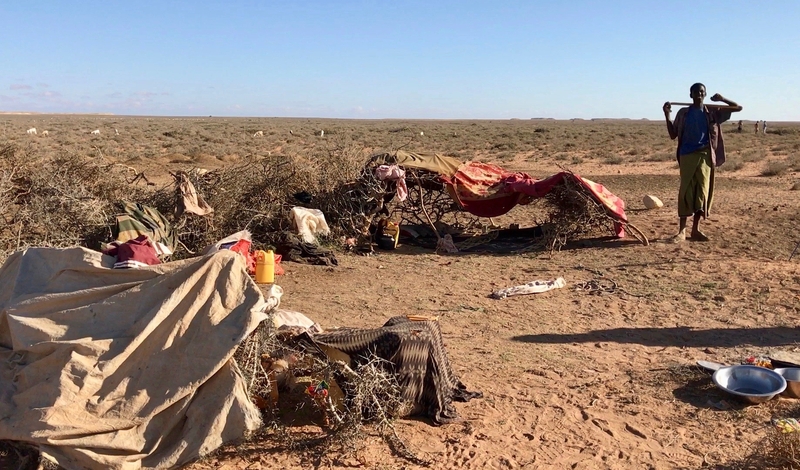 It’s the first time drought has forced the 23-year-old mother to leave her home, some 400 kilometers away, in Garowe, where she’s left her two other young children with their grandparents. All of her camels have died and the goats that remain are too sick to walk, so for now the family must stay put. Sophie Eastaugh is a freelance journalist. Follow her @sophieeastaugh. All photos by the author.